Nicole Reinhart was an aspiring champion and a humble, loving person. In 2000, a race series of four single-day events offered a bonus of $250,000 to the rider who could win all four races. Amazingly, Nicole had won three of four. In the fourth race at the line, she said she wasn’t nervous because she had her team, Team Saturn, behind her. Nicole crashed twice in the race and her teammates worked hard to pull her back to the front for the final lap. It was one of the most intense demonstrations of teamwork I’d ever witnessed, and the most fluid and focused work I’d ever seen in the women’s peloton. Even her competitors were admiring. Just when the crowd expected the Saturn train to deliver the goods and a sprinting Nicole for the win, Nicole crashed again and tragedy struck. This time it was fatal. Everyone at the race was devastated, and so were many world-wide who knew her. 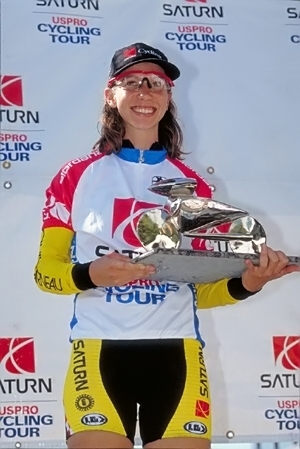 She was just 24 years old and coming into the beginnings of greatness as a cyclist. Just one month before she died, she offered an unusual kindness to me, though I barely knew her. She was an approachable champion in a sport where so few are charitable with their competitors. She had already discovered a generosity of spirit based on faith that takes a lifetime for most to learn, if ever. This optimism was based on an indomitable belief that her efforts would be rewarded. As a young interloper into cycling’s rigid competitive environment, she was a winner and a record-breaker, despite opposition, hardship and criticism. Perhaps her greatness was at its zenith as a person, and in her completeness she was called home where the streets are paved with gold. She’ll be the ride leader when we get there. We are thankful that challenges come which test our resolve. We confess we rely on ourselves when we have access to help from a loving Rewarder. We ask for resolve and realization to believe. Ponder Am I relying on my own efforts alone? Affirm I was made for a purpose and a Person greater than myself. Watch for signs that God cares about you having faith that you will be rewarded. 75I have no reference for this quote, other than a defunct website. But I stand by it as something Nicole would have said. Her father, Mike Reinhart, recounted Nicole’s challenges, opposition, work ethic and beliefs to me posthumously. In over a decade as an endurance athlete, she had won multiple junior national championships, two gold medals at the Pan-Am Games and a professional contract. BMC Software Company, the sponsor of the series in which Nicole was killed, donated the winnings to her family, who used it to set up the Nicole Reinhart Memorial Fund. The fund distributed scholarships to aspiring young cyclists. This entry was posted on December 21, 2010 at 9:32 AM and is filed under The Spiritual Cyclist. You can follow any responses to this entry through the RSS 2.0 feed. You can leave a response, or trackback from your own site.